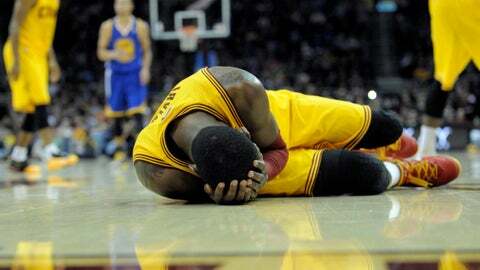 Cleveland Cavaliers point guard Kyrie Irving lays on the court after being hit in the face in the second quarter against the Golden State Warriors at Quicken Loans Arena. CLEVELAND (AP) — Stephen Curry scored 29 points and made a clutch jumper with 13.5 seconds left as the Golden State Warriors opened a long road trip with their fifth straight victory, 108-104 in overtime against the Cleveland Cavaliers on Sunday. Curry overcame a poor shooting performance after halftime, and nearly recorded a triple-double by adding 11 assists and nine rebounds in 48 minutes. Curry was just 2 of 12 from the floor in the second half and OT. David Lee scored 19 before fouling out for the Warriors, who are on the road for seven games over the next 13 days. Kyrie Irving scored 27 for Cleveland, which dropped its fifth straight and lost its third tight game in a row. The Cavs lost by three in Boston on Saturday and two in double-overtime against Atlanta on Thursday. Irving drained a 3-pointer with 9.5 seconds left in regulation to tie it 99-all. The Warriors, who once trailed by 17, quickly pushed the ball up the floor for one final shot, but Curry’s 8-foot runner in the lane bounced off the rim in the last second, sending the teams to overtime. Curry threw his head back in disbelief at the miss. But the silky smooth point guard more than made up for it in the extra session. After Irving missed, Curry fed Andre Iguodala on the wing and the Warriors forward alertly hit a cutting Draymond Green for a dunk to put Golden State ahead 106-104 with 59 seconds to go. Jarrett Jack misfired for the Cavs, and with the 24-second shot clock winding down on the Warriors’ next possession, Curry dropped a contested 23-foot jumper from the left side to put Golden State up by four. The Warriors then stole Cleveland’s last inbounds pass to wrap up a grind-it-out win. Green went just 2 of 10 from the field but added 10 rebounds, and Klay Thompson scored 16 for Golden State. Curry’s shot wasn’t falling after halftime, so he adjusted his game and picked up seven assists in the second half and overtime. The loss wrapped up a strange weekend for the Cavs, who excused Andrew Bynum indefinitely on Saturday for conduct detrimental to the team. The Cavs are trying to trade the 7-foot center, who signed a two-year, $24 million contract with Cleveland in July and showed flashes of being dominant again but became a headache. Bynum’s bizarre situation continues to hover over the Cavs. His locker was empty except for a half-loaf of whole grain bread, a jar of peanut butter, headphones, a pair of sneakers and shower sandals. It’s unlikely he’ll be back to fetch them as the Cavs will either deal or release him before Jan. 7, the deadline for his contract to be guaranteed. The Cavs beat the Warriors at their own fast-paced game in the first half, building a 64-47 lead with 1:13 left before halftime on Jack’s 3-pointer. But Curry, who came in shooting just 32 percent (20 of 63) from the field in his past four games, knocked down a pair of 3-pointers and Golden State closed the half with an 8-0 tear to pull within 64-55 at the break. Curry went 5 for 5 from long range in the first half. The Cavaliers reeled off 18 straight points in the first quarter, turning a five-point deficit into a 12-point lead. Irving and C.J. Miles made 3-pointers during the stunning run, which helped Cleveland open a 35-26 lead after one. NOTES: The Warriors have won six in a row over the Cavs. … Not surprisingly, Warriors coach Mark Jackson had high praise for Curry, who came in averaging 23.2 points and 9.5 assists. "He’s a star player," Jackson said. "I think people realize that. I love the fact he’s picking and choosing when to facilitate, when to score. He’s scoring the basketball but even more impressive is he’s second in the league in assists." … The Warriors will travel 8,300 miles on their road trip, which ends Jan. 8 at Brooklyn. … Cavs coach Mike Brown said he had to take off his expensive shoes during the pregame walk-through and convince his young players he wasn’t wearing Hush Puppies.